How did Mo Farah become a dual Gold Medallist for Britain although born in Somalia? 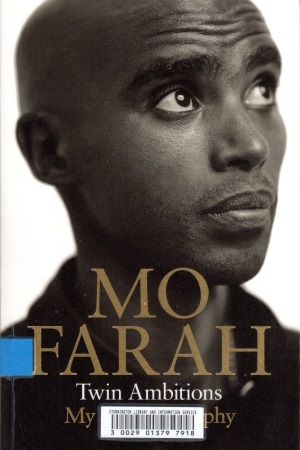 Mo arrived in England aged eight knowing very little English. His talent for running was noticed at an early age and this greatly aided acceptance of him. Early in his secondary school career he so easily won an endurance race that his PE teacher had Mo sign each of his classmates’ diaries because “Mo is going to be a star”. The book is 350 pages long and covers both his life as an athlete and as a person. The name, incidentally, is because he is a twin and the father of twins. It is full of anecdotes and is written in a generous spirit. I don’t recollect a single negative comment about an individual. However, anyone wanting to pick up tips will be disappointed: run up to 120 miles a week and do lots of tough intervals is a broad summary. Oh, and uproot your family to live in America, and go on monastic high altitude training camps in Kenya without family. It is perhaps not surprising that he doesn’t anticipate running at all when he eventually retires. His legacy is safe: winning both the 5000 and 10000 metres at the 2012 London Olympics then performing the same feat in 2013 at the World Championships in Moscow puts him in a very select group. Mo very recently ran the London Marathon at his first attempt at the distance, finishing 8th. The book suggests that he won’t be happy about this and we can anticipate better results in the future. However, he is a racer rather than someone who runs for times which might not help him in the paced big city marathons. Perhaps 2016 in Rio? Review copy from Stonnington library. Recommended.